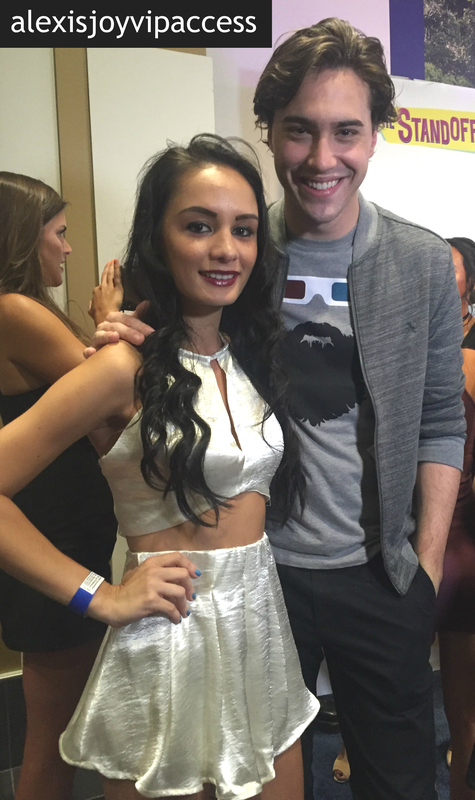 VIPAccessEXCLUSIVE: The Extraordinary Ryan McCartan Updated Interview With Alexisjoyvipaccess At “The Standoff” Movie Premiere! Coming live to you on an off-Broadway show or airing on your TV screens, wherever you see the phenomenal Ryan McCartan exhibiting his indescribable talent, one thing is for sure, you will truly be mesmerized! The outstanding Ryan McCartan is known for his superb talent in both theatrical acting as well as on-screen acting. We’ve seen him in Disney Channel’s highly-acclaimed show, Liv and Maddie and shortly after working on that, he welcomed NYC as his home for a few months as he worked on the off-Broadway show, “Heathers: The Musical.” Ryan McCartan continuously proves himself as a profound actor and gifted musician. Ryan McCartan also takes his terrific talent to the world of music as he and his fiancé, Dove Cameron together make the band, The Girl and The Dreamcatcher. After releasing so many wonderful songs and music videos and giving unforgettable performances to their fans, this power couple continues to make fans’ dreams come true with their musical masterpieces. Continuing off his always busy schedule, we’re all super excited to see Ryan McCartan in FOX’s remake of the iconic Rocky Horror Picture Show where we will get to see Ryan put on a pair of heels and play the legendary role of Brad Majors. Ryan McCartan also worked on a magnificent movie titled “The Standoff” which just recently came out. As a whole, Ryan McCartan is such an eloquent, remarkable and stupendous actor and musician and his star in the entertainment world will continue to shine bright with his excellence. I, Alexisjoyvipaccess had a terrific time covering “The Standoff” movie premiere and had a great time catching up with and interviewing the excellent Ryan McCartan again at the event. Ryan McCartan dished exclusively to Alexisjoyvipaccess all about what it was like working on “The Standoff,” what it was like for him being a part of the Rocky Horror Picture Show, and so much more only in our VIPAccessEXCLUSIVE updated interview. Ryan McCartan even talks about the training that went into portraying the role of Brad Majors in Rocky Horror Picture Show – hear what Ryan McCartan had to say in our updated VIPAccessEXCLUSIVE interview below. Thanks for another fun interview, Ryan – always a blast chatting with you! Check out my VIPAccessEXCLUSIVE updated interview with the sensational Ryan McCartan at “The Standoff” movie premiere below! “The Standoff” movie is a fun-filled, spectacular movie that everyone can enjoy! With an amazing cast and a superb storyline, “The Standoff” will be a movie that you will want to watch over and over again. Be sure to get “The Standoff” movie available now on iTunes for purchase or to rent here! Previous Article: Pitbull, Flo Rida, Becky G, Nicky Jam And More Are Joining The Lineup Of Performers At The Latin American Music Awards! Next VIPAccessEXCLUSIVE: The Outstanding Merrell Twins Updated Interview With Alexisjoyvipaccess At “The Standoff” Movie Premiere!